I think I know where the saying, “Oh fudge!” came from. It was from someone trying to make fudge. 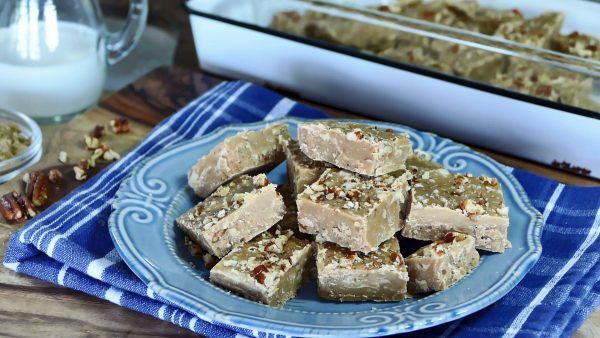 Frustrating doesn’t even begin to describe the experience for so many of us who have tried and tried….and tried to hit on the perfect fudge recipe! Generally, with most recipes (excluding fudge) you try it and if it doesn’t turn out the way you want, you can tweak it the next time. Not with fudge. You make a recipe for fudge and it turns out perfectly. Then you make it exactly the same way the next time and it’s an epic fail. Oh fudge! So when I came across this recipe for Brown Sugar Fudge, the caption captivated me: “Lush, velvety texture.” The first batch produced the most magnificent flavor but the texture was too grainy. Reviewing the process, I realized I probably didn’t stir the mixture enough to completely dissolve the sugars. Also, I may not have stirred as vigorously or as long I should have when the mixture had cooled. So for the second go around, I corrected those steps. It was so much better! It yielded the same fantastic flavor with a creamier texture but not as “lush or velvety” as I wanted. So, I had to do it. I had to give it one more go. Before I give you the results of the final batch, I want you to know that in order for me to commit to giving any recipe three tries, it has to fit my criteria: First, I have to believe that the recipe will be worth your while, since I’m writing this column for you. Second, the recipe has to be simple with inexpensive ingredients. Well, the third time for me was not a charm. It had that same great taste, but I never got the rich and creamy texture I was hoping for. Not being a fudge aficionado, it could be that this texture is right for this recipe. The flavor makes it worth a try. Ready to fudge? In a medium saucepan, combine brown sugar, granulated sugar, corn syrup, heavy cream, and salt. Heat on medium, stirring to dissolve the sugar. Insert candy thermometer and cook until mixture reaches 238 degrees (soft ball stage). Add vanilla and beat vigorously with a wooden spoon until smooth and creamy and begins to dull. Fold in optional pecans. Pour into prepared pan and let harden. Cut into squares. Store in airtight container.